Independent Directions to this Site: From Highway 417, 39 km east of Ottawa, take the Limoges exit (79) and go NNW for 4.4 km on Limoges Road (CR 5), through the town of Limoges to the junction of this road with Regional Roads 8 and 37. Follow the right hand curve on Regional 37 or the Saumure/Clarence-Cambridge Boundary Road northeast for 0.9 km to where Saumure turns left. Then continue straight northeast on the Clarence-Cambridge Boundary Road for an additional 9.8 km to Skidder Road North of Clarence-Cambridge Boundary Road. Turn left or NNW onto Skidder Road. Larose Forest Loop Route Directions: From Bouvier Road at the Clarence-Cambridge Boundary Road, go east on the Clarence-Cambridge Boundary Road for 1.2 km to Skidder Road North of Clarence-Cambridge Boundary Road. Turn left or NNW onto Skidder Road. Map of the Skidder Road North of Clarence-Cambridge Boundary Road Area Click on other site numbers to go to their pages. 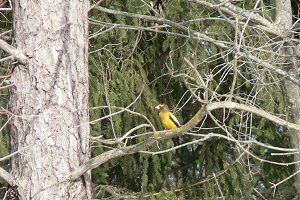 Site Description and Birding Information: Skidder Road (sometimes labelled "6") North of Clarence-Cambridge Boundary Road is a dirt road/track giving access to the forested area in the north central portion of the Larose Forest. In places it deteriorates into little more than a dirt track, so while it might be driven, especially with a 4-wheel drive vehicle, walking is still the best option. There is a good mix of deciduous and coniferous forest with scattered wooded swamplands along the way. At about 1.0 and/or 1.3 km from Clarence-Cambridge Boundary Road, you will come to the ski trail (depending on the branch); and at 1.6 km, the ATV trail (Rd 25). The area can be quite wet in any season but winter, so boots are recommended in warmer months. Insects can be bothersome at that time too. 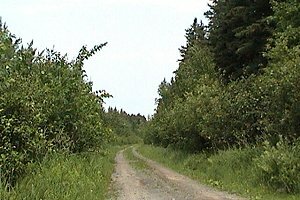 About a half kilometer east of Skidder Road, along Clarence-Cambridge Boundary Road, the protected forest ends and private homes can be found. Feeders at these homes cam often produce good birds in winter. 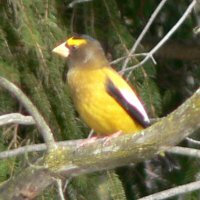 Watch for Evening Grosbeaks along this stretch. Larose Forest Loop Directions: From Skidder Road at the Clarence-Cambridge Boundary Road, return west on the Clarence-Cambridge Boundary Road for 0.2 km to Nile Mile Road (Neuf Milles Road). Turn left or SSE onto 9 Mile Road and drive 1.7 km to the next site on this route, Route 100 Trail at Nine Mile Road.